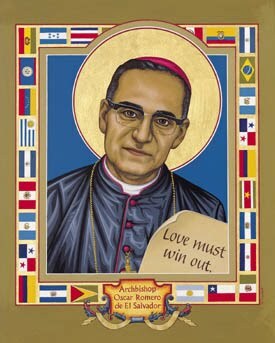 Today is the 30th anniversary of the assassination of Oscar Romero, the Archbishop of San Salvador. You can listen to a good 26 minute program from the BBC here which gives some good background and interviews of people who were with Romero when he was murdered. You can also find loads more info at the website of the Romero Trust. I became aware of Romero while at SEITE when I was looking at liberation theology as part of a module on mission. Romero believed wholeheartedly, as would many of us, that the gospel should transform the world, particularly society, as well as the soul. Gospel liberation, says Liberation theology, is not just spiritual, it must be social and political as well. As a practical response to his interest and belief in liberation theology, Romero moved out of his palace to live with the people so he could ‘listen their pain’. In the face of oppression and government led brutality he spoke out, which was a surprise to the Vatican as he was appointed with the view that he was a moderate – and he was until he saw the murdered body of his Jesuit friend. It seems the reality of the real life situation changed his outlook for ever. I love some of Romero’s words; which when you take them in the context of the horrific and brutal regime of fear he was working under, show them selves to be words of true faith and courage. This appeal was too much for the authorities and the next day Romero was dead, shot while celebrating mass in the chapel. One thing that amazes me, I guess, it that Romero has not been made a saint by the catholic church. In fact it does seem that other churches recognise Romero far more than the catholic church does. Why is that? I wonder if he is still seen, even after 30 years, as an embarrassment … whatever, I think their, at best oversight and at worse, ignorance of this mans faith is quite shocking. Some say it’s only matter of time, while other wonder if it will ever happen at all as the current pope is known to be a great opponent of liberation theology …. well you would be wouldn’t you if you lived in the Vatican – you wouldn’t want to move out of there! This entry was posted in church, faith, liberation theology by robryan65. Bookmark the permalink.